Mikael Agricola (accent on the first syllable, as in most Finnish words not compounds), was born in Uusimaa, Finland, about 1510. He went to school in Viipuri (Viborg) and then in the cathedral town of Turku (Abo). 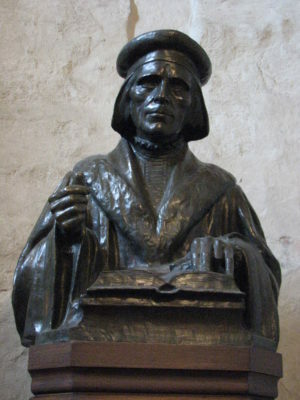 The bishop of Turku, a Dominican monk, sent him to study at Wittenberg, where he met Luther and Melanchthon, and upon returning home, became rector of the cathedral school and eventually assistant to the bishop. On the death of the bishop in 1554, he was consecrated as the new Bishop of Turku without papal approval, and carried out a relatively conservative program of reform along Lutheran lines, retaining traditional doctrines and practices wherever he did not see scriptural grounds for rejecting them. Mikael saw the importance of worship and teaching in the Finnish language. He accordingly established rules of orthography which are the basis of modern Finnish spelling, and wrote an Aapinen (primer), a prayer book (with other information), a translation of the New Testament, and a translation of the Liturgy. He translated many hymns into Finnish, and collected hymns that had been written or translated by others. He also took pains to learn what he could about the ancient pre-Christian myths and folklore of the Finnish people. He is accounted the father of written Finnish. His accomplishments as a bishop are the more impressive when we remember that they took place in a short time. Three years after he became bishop, he was sent to negotiate a treaty with the Russians, and on his return fell ill and died suddenly, in his forties.